All members are invited to join us for a run followed by supper at The Royal Oak. Meet at 7pm at the Sports and Social car park for training/social run and then at 8:30pm at The Royal Oak for sandwiches and chips. Everyone is invited to Nadine's at 6pm for a 6-7 mile run from her house followed by food and drink. Please let Nadine know if you are able to come along. Everyone had a wonderful time at our annual Presentation Evening at Garstang Country Hotel. The meal was delicious and the evening provided plenty of opportunities to chat or take part in some energetic dancing to many well loved songs played by the resident DJ. The extremely enjoyable evening also saw a large number of members receive trophies and mementos to celebrate their achievements during the year. A huge thank you once again to Sheena for all her hard work in organising the event. Another successful evening, this time held at the Wheatsheaf, was enjoyed by over 25 members after the usual Tuesday training sessions. Lovely sandwiches and pork pie - shame chips were off the menu!! Many thanks to Alan for organising the evening and leading the head torch run! Over 30 club members came along for a festive supper of sandwiches and chips at the Crown on Garstang High Street following our Tuesday training! Everyone enjoyed the wonderful social evening very much and our thanks go to Alan for organising the event. We had a lovely festive evening and 3 course meal at the Priory in Scorton - a wonderful start to our Christmas celebrations! A huge thank you to Sheena for organising another very successful event! Almost 30 club members came along to Blackpool to have a run along the promenade, see the illuminations and enjoy fish and chips afterwards at the Bispham Kitchen! A great turn out despite it being a bit of a drizzly evening! A very enjoyable outing - as always! 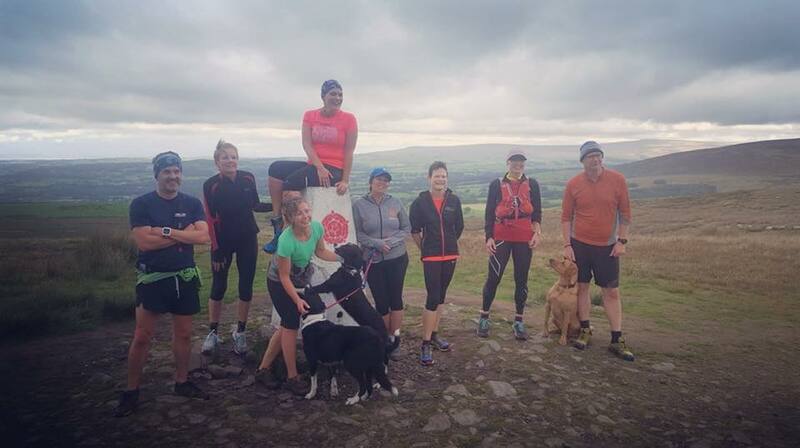 We had a lovely 'celebratory' run over Nicky Nook with some of Jane's friends, despite nearly having to leave Jane on the top of the trig point, that she was encouraged to climb for a photo!! Fortunately she did manage to get down safely in one piece! The BBQ was a splendid affair which her friends seemed to have organised to perfection - a huge thank you to them for their hard work! Not quite the calming evening usually experienced before the big day but very much enjoyed by all! Thank you so much Jane and Graham, and we send our very best wishes to you for many happy years ahead together! Another large crowd gathered at Paul's house in Nateby to take part in his 60th birthday celebrations! The sun shone through the parting clouds as we ventured out on a lovely run on the fields and tracks around Nateby. Afterwards, having worked up a hearty appetite, we were treated to a sumptuous feast, carefully prepared by his wife Liz - it was truly delicious!! Thank you so much to Paul and his family for such wonderful evening! A large group of members joined us on this lovely summer's evening run organised by Amie and Jack! Everyone was catered for with options ranging from a 3 mile walk to an 8 mile run! The evening was very much enjoyed by all and the supper afterwards at the Manor Inn, Cockerham was delicious! A huge thank you to Amie and Jack for their hard work in organising such a superb evening! 13 intrepid members took part in the tough challenge of running up Long Lane and then back down through the fields on a very warm summer's evening! This was a very enjoyable social occasion and a big thank you must go to the members who turned out to help marshal the event and to Tony who organised it all! Trophies were presented to the fastest male/female overall at the The Royal Oak afterwards, where we all enjoyed a hearty supper and refreshments. A large group of us were fortunate to be able to enjoy a wonderful evening celebrating Frank's last run as a Vet 65! After a lovely run up towards Calder Vale and then across to Burn's Farm, we went back to his house for a delicious supper of sausages, bacon and Anne's special 'cowboy' beans, followed by her scrumptious brownies! A huge thank you to both Frank and Anne for a fantastic time! We wish Frank every success in his races as a V70! Members and their partners enjoyed a fabulous evening at Garstang Country Hotel. The food was delicious and many found the energy to dance the night away to some lively disco tunes! A wide range of trophies and mementos were distributed to members who had qualified for the road, trail, fell and cross country championships as well as the handicap races. A huge thank you once again to Sheena for her hard work in organising the event and to Garstang Country Hotel who provided us with some excellent facilities! A excellent time was had by all! A wonderful, festive evening was enjoyed at the Apple Store! A huge thank you to Sheena for organising the event and to Sally at the Apple Store for hosting it! A big thank you to Alan and Julie for hosting another of their special 'chilli nights'. After a quick blast up Nicky Nook, everyone was treated to a hot and tasty chilli supper! A fabulous evening enjoyed by all! A few of us enjoyed a nice little spooky 5k at Heron's Reach, Blackpool. A big thank you to Julia whose delicious Halloween cakes helped make it an evening to remember! Good bling too!! We all had a lovely run on the prom, admiring the illuminations along the way, and finishing with delicious fish and chips at Bispham Kitchen! A great evening was enjoyed by all! What a fabulous time we had on our social run from Nigel's house, next door to the Cafe d'Lune! Perfect weather, a beautiful sunset, great company, delicious food - what more can one ask? Thank you so much Nigel and Jackie for a wonderful evening! A huge thank you to Amie and Jack for an amazing night and a great supper! 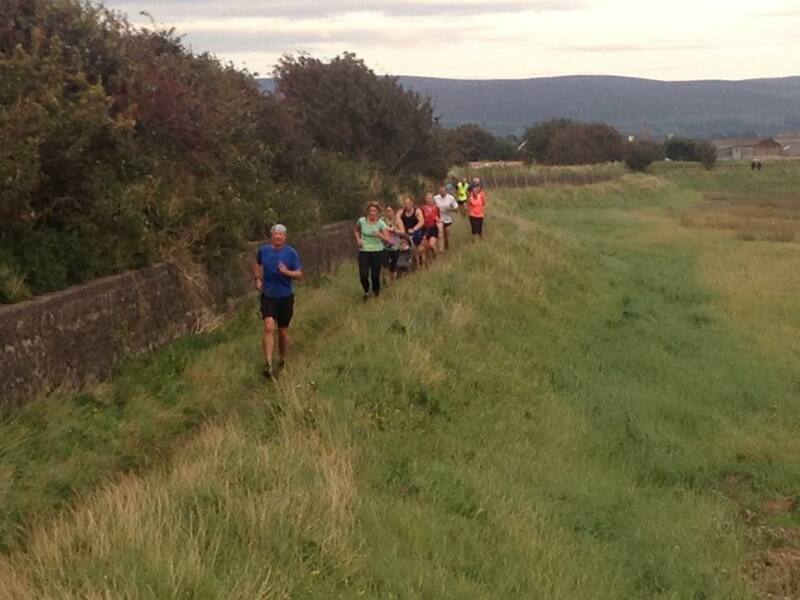 Everyone enjoyed the lovely run around the countryside of Cockerham!